Blue Waters, entering full deployment, is now crunching numbers around the clock at the National Petascale Computing Facility at the University of Illinois, US. Led by the National Center for Supercomputing Applications Blue Waters is funded by the US National Science Foundation to address the most challenging compute-, memory-, and data-intensive problems in science and engineering. While theory and experimentation are the traditional pillars of scientific discovery, computational science has evolved as the third critical pillar, enabling researchers to explore phenomena that are too small, big, fast, or dangerous to investigate in the laboratory. US leaders from government, academia, and industry gathered to reinforce this foundation, officially launching one of the world's most powerful supercomputers - Blue Waters. Blue Waters is located at the National Center for Supercomputing Applications at the University of Illinois in Urbana-Champaign, US. Image courtesy NCSA. Configured to tackle the most challenging compute-, memory-, and data-intensive problems in science and engineering, Blue Waters boasts 22,640 compute nodes, over 1.5 petabytes of memory, and 26 petabytes of disk storage. At peak performance, the supercomputer can perform 11.6 petaFLOPS per second (1 petaFLOPS equals one quadrillion floating-point operations per second), with sustained speeds of 1 petaFLOPS. This feat makes Blue Waters the most powerful supercomputer on a university campus, and one of the most powerful in the world. 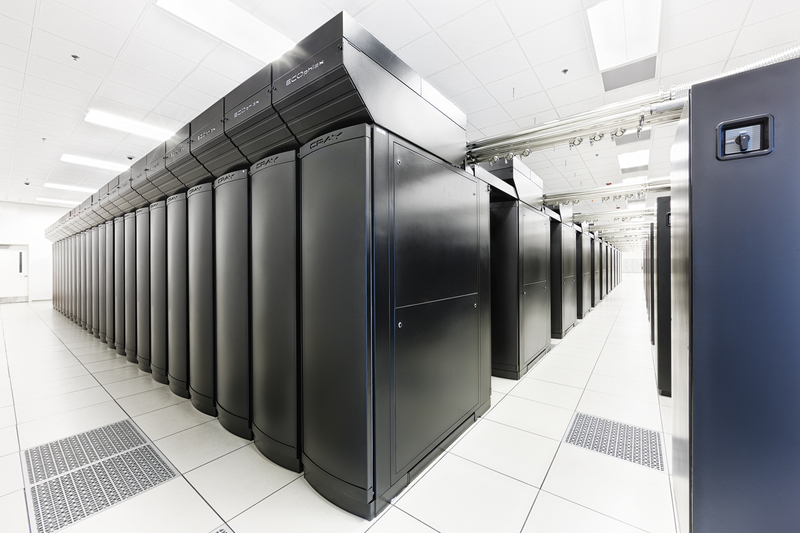 The US National Center for Supercomputing Applications (NCSA) has been offering world-class computing resources to science and engineering researchers since 1986. The US LEED-rated National Petascale Computing Facility, with energy-saving onsite cooling towers, is home to Blue Waters as well as NCSA's other high performance computing, networking, and big data systems. The US National Science Foundation (NSF) provided deployment and operational funding for Blue Waters, awarding $208 million to the project. Cora Marrett, NSF acting director, was on hand to emphasize the supercomputer's potential. "Its impact on science and engineering discoveries and innovation - as well as on national priorities such as health, safety and wellbeing - will be extraordinary. This ecosystem is the bedrock of our economic prosperity and national security." "Blue Waters will allow national researchers access to the most powerful computational resources available today, enabling the investigation of problems not possible before," adds Farnam Jahanian, head of NSF's Directorate for Computer and Information Science and Engineering. National Petascale Computing Facility at the University of Illinois in Urbana-Champaign, US. Image courtesy NCSA. Additional funding from the State of Illinois and the University of Illinois made the project possible. "Blue Waters opens new doors for discovery - and placing it at the heart of our university will allow scientists and researchers to generate knowledge that would otherwise be out of reach," says Peter Schiffer, vice chancellor for research at the University of Illinois. Blue Waters is one of two NSF-supported supercomputing systems formally dedicated and available for production-scale use. The other, Stampede, is at the Texas Advanced Computing Center at the University of Texas at Austin. These two projects are part of NSF's comprehensive strategy for advanced computing infrastructure, which facilitates transformative foundational research in computational and data-intensive science and engineering across all disciplines. In addition to hosting the most powerful supercomputer on a university campus, NCSA is home to the Extreme Science and Engineering Discovery Environment (XSEDE) Operations Center, which provides a 24/7/365 help desk for integrated digital resources and services that advance research and scientific discovery.The NSF awarded $1.21 million to this NCSA-led project.